We make available Impact Testing Machine Model SE-IT 30, which is specifically designed for conducting Izod & Charpy Test. The test methods in the machine conform to BS: 131: PART 4-1972 (Amended 15 Aug. 1993) & BSEN: 10045 - 2: 1993. Impact Testing Machine is suitable for testing raw material specimen as well as finished components. 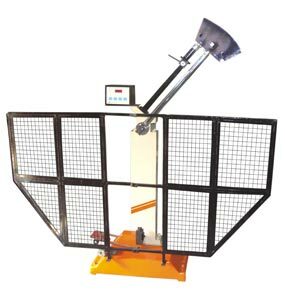 Avail from us the Impact Testing Machine at market leading prices. The Pendulum supported in the starting positions is by a self resetting latch. The release mechanism is operated by lever. The Pendulum release latch is operated only when this lever is operated. Net Weight (Approx.) 375 Kg. 375 Kg.